Prague Siesta Apartments, Praga, Czechy : Rezerwuj teraz! 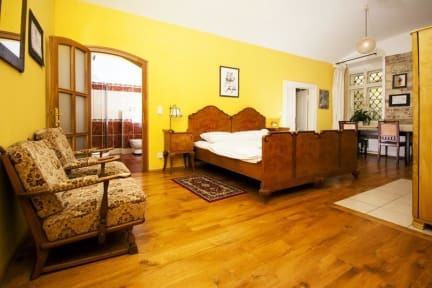 Prague Siesta Apartments is located in a quiet street, just 50 m from Old Town Square with the Orloj Astronomical Clock and Týn Cathedral and offers free WiFi. Guests can benefit from free smart phone with unlimited calls within the Czech Republic, internet connection, GPS and various apps. Guests can unwind at Prague Siesta Café located in the same building. The café offers wine from Moravian vineyards, beer from a local family brewery, freshly roasted coffee and tea from all around the world. Babysitting services can be requested at a surcharge. The owner and staff can also recommend suggestions for interesting places to go to and activities to do. Prague Siesta Apartments is located in a quiet street, just 50 m from Old Town Square with the Orloj Astronomical Clock and Týn Cathedral. The Náměsté Republiky Metro Station is 300 m away, as well as the Palladium Shopping Centre. The property is situated 600 m from popular sites such as Wenceslas Square and Charles Bridge. Various shops and restaurant can be reached within a 5-minute walk. Decorated in unique design created by local artists, the apartments at the vintage Prague Siesta Apartments all come with handpicked antique furniture, an equipped kitchen, a flat-screen TV, and a bathroom with free toiletries.